Karina's Kreations: Earning Alaska Blog Hop! 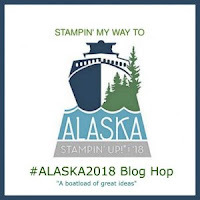 I'm participating in the Earning Alaska Blog Hop today. The theme this month is Sale-a-bration. There are only 3 weeks left of Sale-a-bration and Free items are while supplies last. You can earn a free sale-a-bration item with a $60.00 order. I decided to create a gift card holder using the Make a Medallion sale-a-bration stamp set. 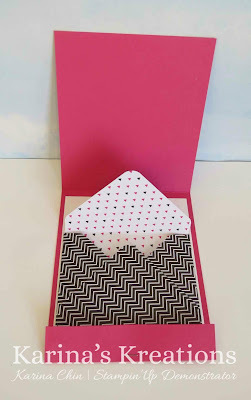 The gift card holder is made with 4-1/4" x 10-3/4" Melon Mambo card stock scored at 7/8" and 6". I stapled the bottom part of the card base to make a matchbook style card. The Pop of Pink specialty designer paper #141648 is 4" x 4-1/2". The inside envelope is 5-1/2" x 5-1/2" and made using the envelope punch board. The score line is 2-3/8". The sentiment is stamped with Melon Mambo and Black archival ink cut out with the layering circles Framelits #141705. If you live in Canada, click this link to place an online order! Thanks for looking at my blog and make sure to check out all the great projects from the other people! Love your project, I need to make some of these. Great project, thank you for sharing instructions! Thank you! It's a fun card to make! !